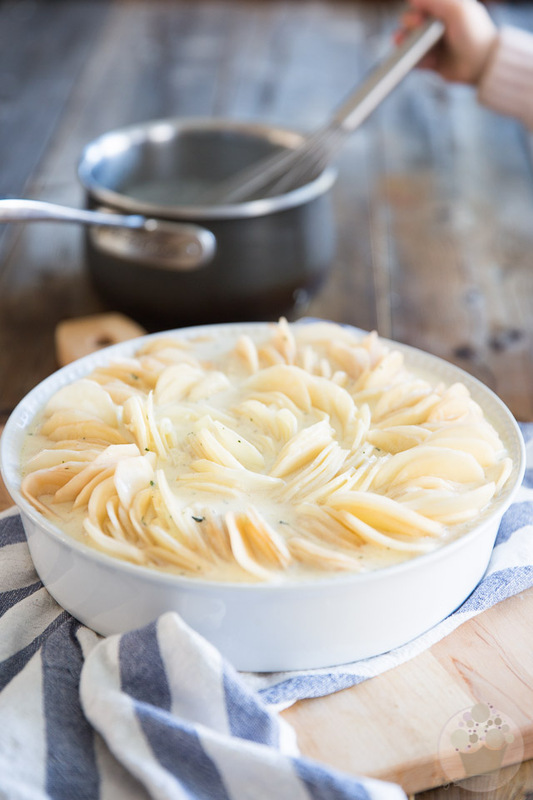 Creamy, dreamy, melt-in-your-mouth Scalloped Potatoes made super elegant thanks to a simple twist. Perfect for any occasion, they are guaranteed to please! 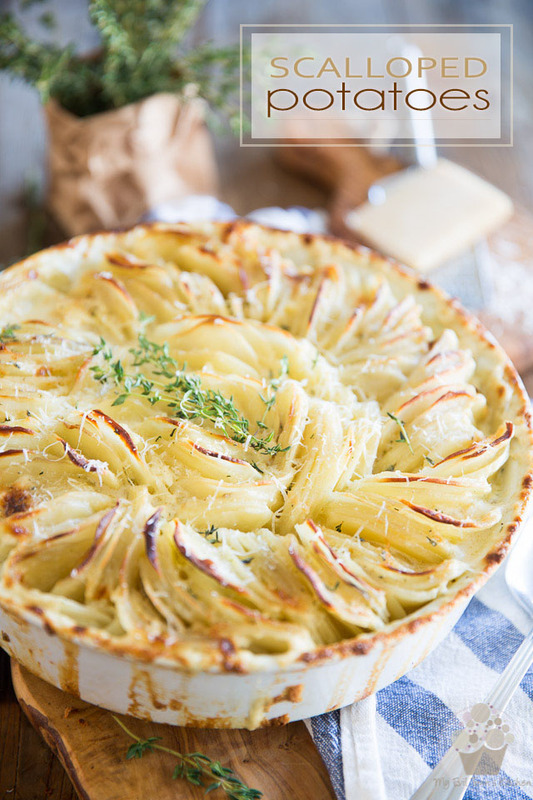 Scalloped Potatoes — they’ve always been my ultimate favorite way of enjoying potatoes. And that’s favorite with a capital F.
I mean, potatoes by themselves are pretty darn good to start with, no matter which way you prepare them. 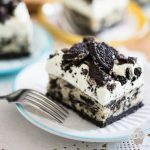 But slice them up super thinly, drown them in a pool of cream and butter, infuse them with a tiny little bit of garlic and then let them cook long and slow in that rich bath of yummy goodness and you get a dish that is nothing short of heavenly. 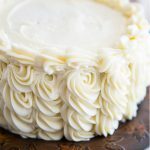 Up until recently, though, Scalloped Potatoes I would only make on VERY special occasions — firstly because they’re pretty rich and so decadent that I wouldn’t feel right eating them regularly — but also too, because I have no patience for arranging layer upon layer of potato slices and then pouring a little bit of cream over each of these layers the way most traditional recipes have you do it. That was until I recently got the idea of stacking the potatoes vertically in the pan, as opposed to horizontally. HA! Now that was a TOTAL game changer! It’s crazy how a simple little shift in position will make ALL the difference in the world! First, the dish looks like 2 million billion times prettier. I mean seriously, look at this gorgeous plate of potatoes – I almost didn’t want to dig in and destroy it, because I thought it was so pretty. 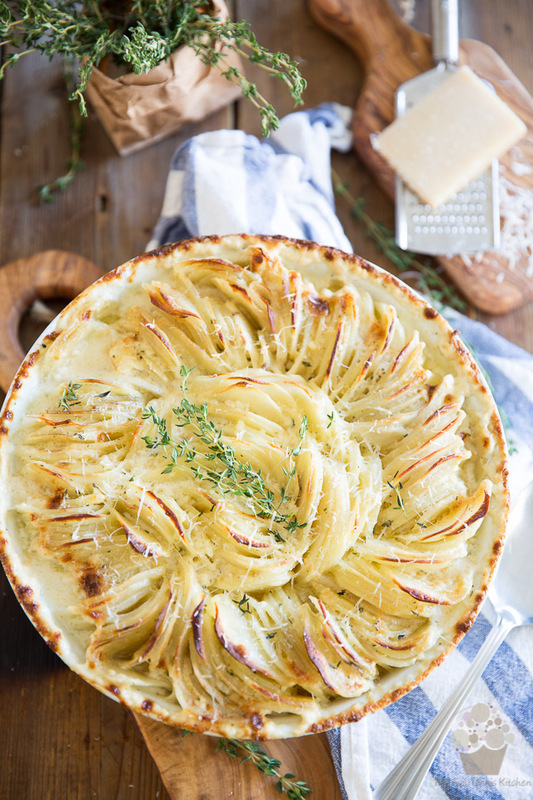 Plus, arranging the potatoes in this way also takes the gratin to an entirely new level in the texture department. Indeed, not only do the potato slices that get to soak in the rich-creamy-buttery bath the whole time end up becoming fall-apart soft and creamy, but the parts that remain exposed to air get to be all nice and deliciously crispy. Most of all, though, arranging the potatoes vertically in the dish really is a breeze and it’s super fun, too! It’s like you’re making art as you go. And the best part is, it only takes seconds! 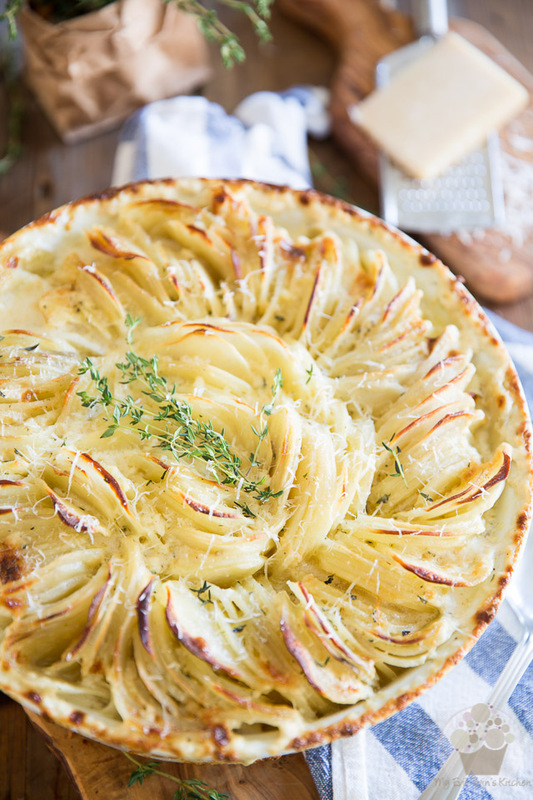 Preheat your oven to 400°F, peel the potatoes and slice them to about 1/8″ thick. The use of a mandoline here is strongly recommended. 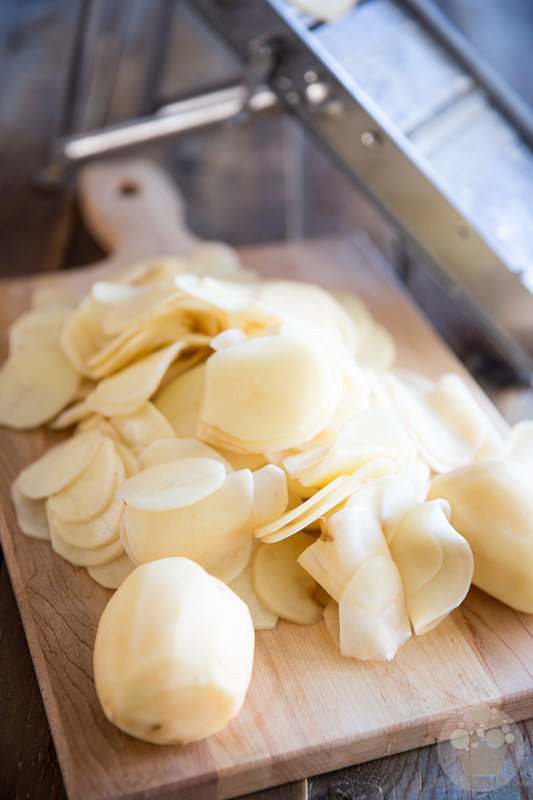 While technically, you could slice the potatoes with a knife, you would never be able to get them THIS thin and uniformly sliced, unless you had crazy outstanding knife skills! And honestly, if you don’t have a mandoline yet, I think that you should definitely consider investing in one. 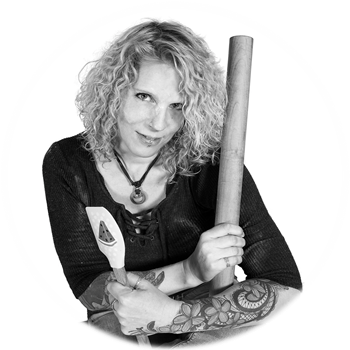 While it might not be the one tool you’ll be using the most often in the kitchen, on the occasions that you do use it, it’ll save you tons of time and you’ll be super glad to have it. Seriously. Take my word for it. It’s totally worth the investment! 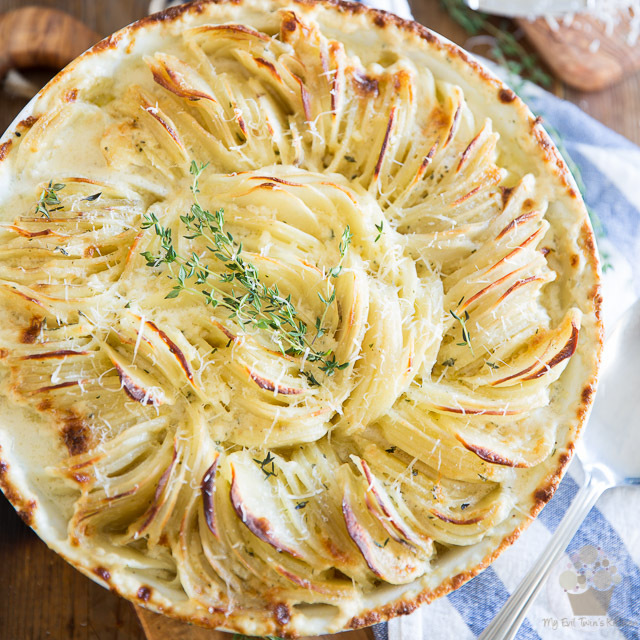 Once your potatoes are sliced, arrange them vertically around a 10″ round baking dish. 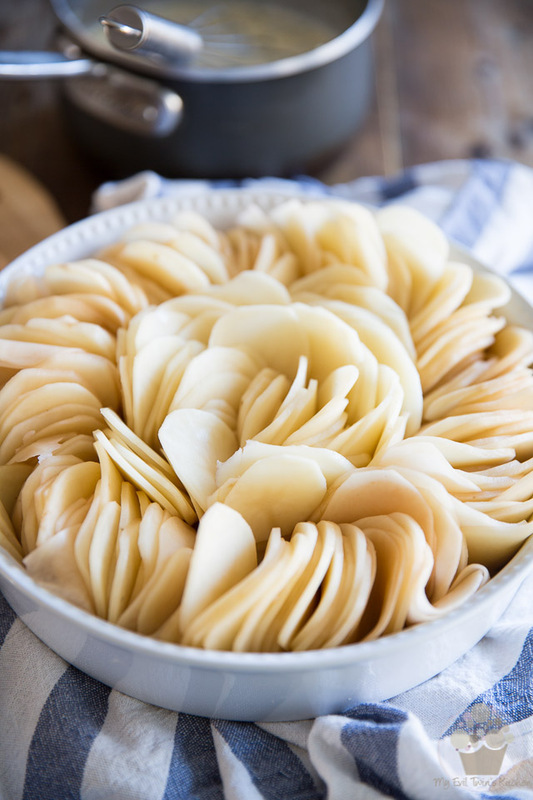 This is not an exact science: you want your potato slices to look pretty and to be packed tight enough that they stay upright, but not so tight that there will be no more room for the the cream to get in between the slices later. Oh, and whatever you do, DO NOT rinse your potatoes, ever. Not after peeling them, not after slicing them. You want to keep as much of that precious starch on them as you possibly can. Yes, that means that your potatoes will discolor, but that’s okay. It won’t show at all once the potatoes are cooked. Next, combine the cream, milk, Parmesan cheese, butter, Dijon mustard, minced garlic, thyme, salt pepper and nutmeg in a small saucepan and bring that to a simmer over low-medium heat. 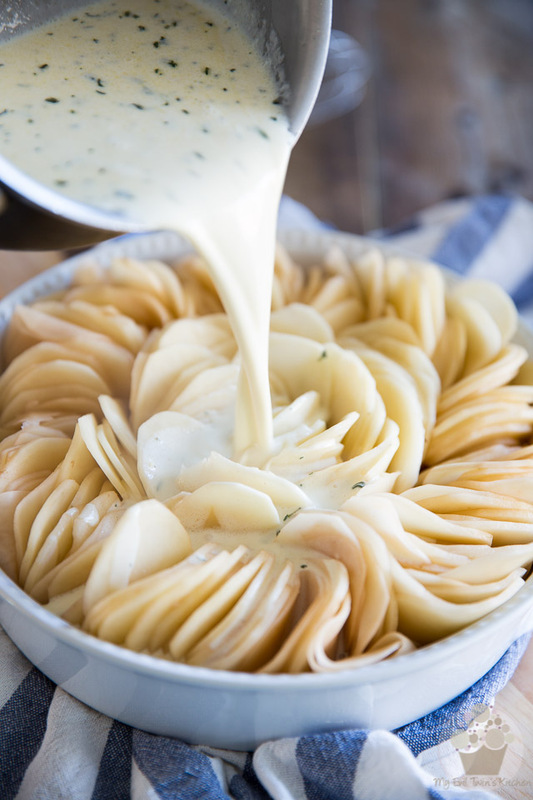 Once all the cream has been added, you’ll want to delicately move the potato slices around with your fingers, just to help the cream get between all the slices. As you can see, my dish was filled pretty much all the way up to the top. 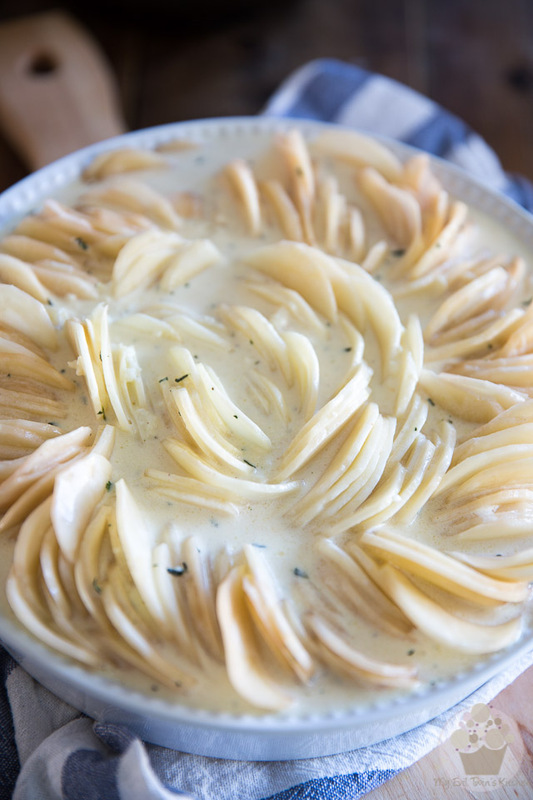 That’s quite fine — I don’t think that there is such a thing as too much cream in Scalloped Potatoes. However, if your dish was this full too, you might want to place a piece of foil or a roasting pan on the rack directly underneath the dish in the oven, to catch any potential over-spills. Now cover your dish with aluminium foil and place it in the oven for 60 minutes. Before I do that, though, allow me – if you will – to shift the direction of my lens slightly upwards… See that tiny little hand in the background? I had a helper with me, that day! She’s grown quite a bit since the last time she made an appearance on here. 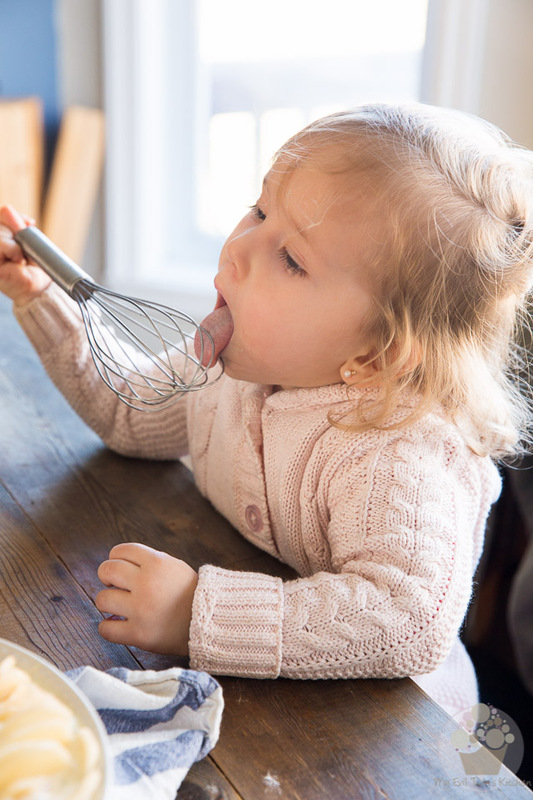 Remember the little squirt I’d made a Lemon Raspberry Ombre Cake for so she could smash it down to crumbs (but totally refused to) almost a year ago? Yep, that’s her! That’s the love of my life, my sweet baby grand-daughter. I get the feeling that she’ll love spending time in the kitchen with granny, that one. 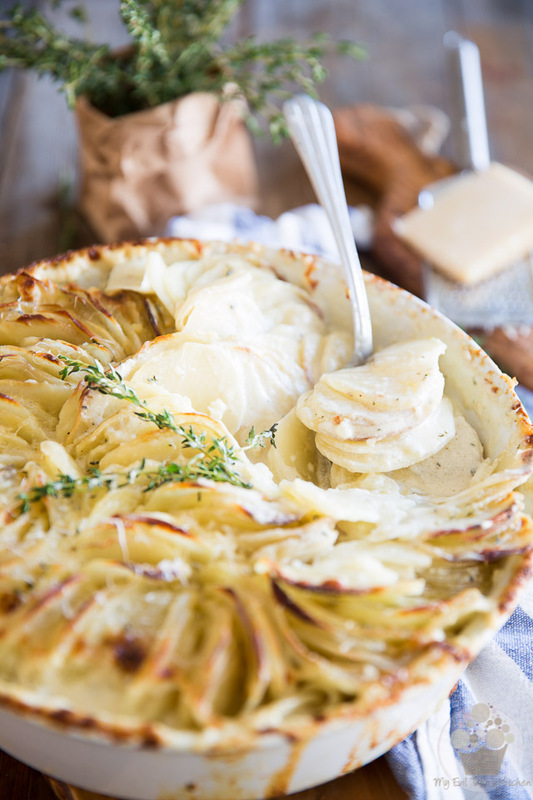 Back to our Scalloped Potatoes… after they’ve been in the oven for 60 minutes, remove the foil and continue baking until the top turns golden brown and the potatoes are super tender. This should take about 30 to 35 minutes. Finally, kill the heat and crack the oven door open and let the potatoes rest for 15-20 minutes. While not absolutely mandatory, this resting time will allow the cream to thicken even more and the potatoes to become softer and creamier, as they soak up more of the moisture from the cream. Trust me, that little bit of additional waiting time is entirely worth it. When you’re good and ready to serve, sprinkle a little bit more grated Parmesan cheese as well as a pinch of chopped fresh herbs over the potatoes. Just to make them look even more prettier… not that they need it, but hey — food can NEVER look too good. 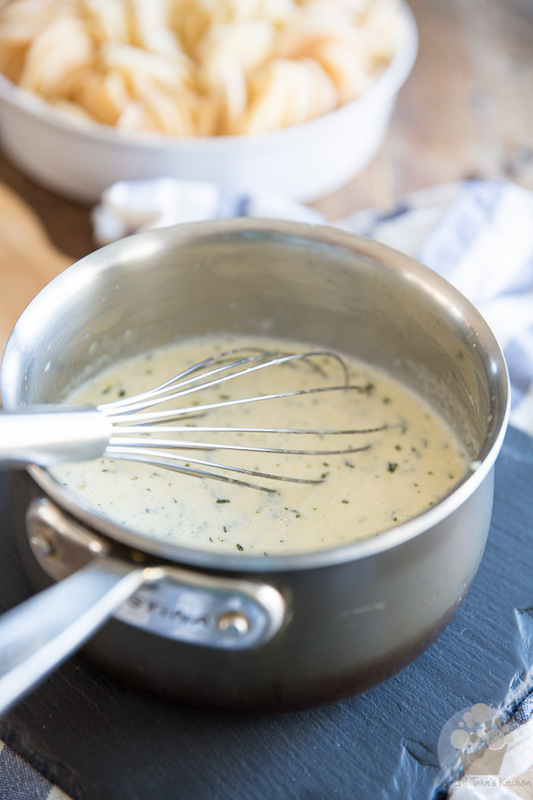 Combine the cream, milk, parmesan cheese, butter, Dijon mustard, minced garlic, thyme, salt pepper and nutmeg in a small saucepan and bring to a simmer over low-medium heat. Pour the cream mixture over the potatoes; delicately move the potatoes around with your fingers a little bit to help the cream get between all the slices. Cover with aluminium foil and bake for 60 minutes. You might want to place a piece of foil or a roasting pan on the rack directly underneath the dish to catch any potential overspills. After 60 minutes, remove the foil and continue baking until the top is golden brown and the potatoes are super tender, about 30 to 35 minutes. Kill the heat, crack the oven door open and let the potatoes rest for 15-20 minutes. Garnish with more grated Parmesan and a sprinkle of chopped herbs and serve. Hi Sonia, I had this same idea and searched the web to see if anyone else had tried and I found your blog! The dish looks beautiful an I can’t wait to try it out for Christmas dinner today! Awesome! Hope you and your guests like it! 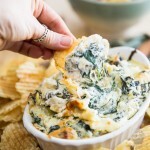 Made these for a dinner party and they are AMAZING! 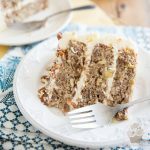 Super easy and a beautiful dish! I will be making them again for Thanksgiving.